These Ideals Inspired us to Create One Single Package to give you Everything you Need to Start Planning your next Bridal Party Gathering and to Ultimately Save you Money! Why Bother with the Hassle of Ordering Several Pieces when we've Done all the leg Work for you! 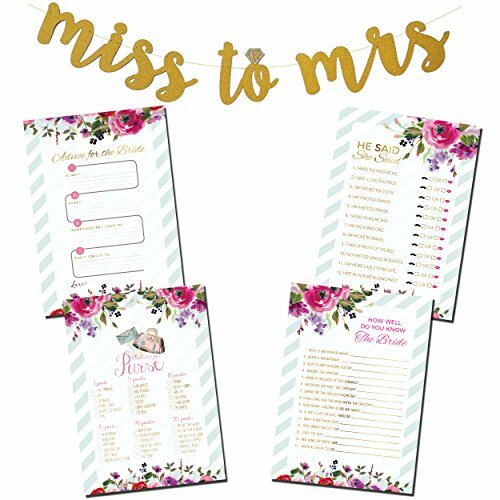 ➼ 1 - "Miss to Mrs." Gold and Glitter Banner with Diamond Ring Accent as the "O" in to. ➼ Endless Countless Laughs and Stories to be told for years to come! ❤ ONE STOP SHOP: This Bundle Provides You With Everything You Need to Start Planning Your Next Bridal Shower or Bachelorette Party. No Need to Buy Everything Separate! ❤ 3 CLASSIC GAMES: These Fun and Interactive Games are Sure to Provide Plenty of Laughs for All your Guest. All Games Come with 50 Individual Sheets Each and are Printed on High Quality 8.5" x 5.5" Paper for Easy Use on Any Surface. ❤ ADVICE FOR THE BRIDE: Give All Your Guest an Opportunity to Leave a Note for the Bride and Groom. With 50 - 8.5" x 5.5" Advice Cards Included, There is Plenty of Room to Share Your Wisdom with the Happy Couple for a Long and Fruitful Marriage. ❤ 100% SATISFACTION GUARANTEE: We Are Confident that Your Guest will have a Great Time and Love These Unique and Custom Designed Games. If for any Reason this isn't the Case, Please Contact us Immediately and we will be Sure to Help you Resolve the Issue. If you have any questions about this product by Knot Your Mother's, contact us by completing and submitting the form below. If you are looking for a specif part number, please include it with your message. 24 Baby Shower Poop Emoji Scratch Off Lottery Ticket Raffle Card Game | One Winner | Gender-Neutral, Boy, Girl |Great for Diaper Raffles, Ice Breakers, Door Prizes, and More!